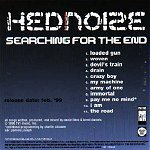 A classically trained pianist mixed with a DJ is the foundation for Hednoize's pop-structured industrial mayhem. Creating every sound on the disc by themselves, with the help of their Power Macintosh G3 with "every audio software program imaginable," a piano, electric guitars, an EMU Sampler, and a Sony effects box, Hednoize expands on waters originally treaded by their influences (Depeche Mode, U2, and Nine Inch Nails) and brings them to the new millennium. Through thick guitars, an endless array of drumbeats, and their computer, the band is able to create a powerhouse of sounds that mix well together nicely, sound tough, and never give up. But, with the addition of the piano, the album has soft spots that mix well with the tougher edges of the music, and give the band a wider field in which to play on. "Drain" is a loud, aggressive number while "My Machine" is a faint, whispery cut. But, somehow the band is able to make both sit comfortably next to each other, using one to build anticipation and the other to offer up a rejuvenating period before they unleash the power and fury of the next track. Industrial in foundation, this album is much more than an electronically created industrial disc. It is a revved up machine pumped full of fuel and ready to run over all that don't take notice. Knowing its limits and boundaries, it can take on corner and be soft while diving around the next corner with a pounding sensation. The options are there, and they use them. I'll give this disc a B+.